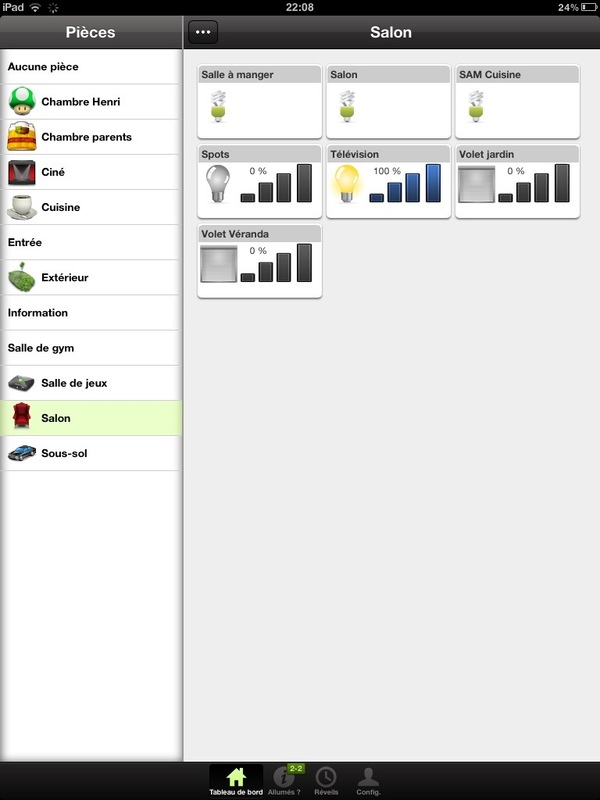 I created this thread on MyVera on the occasion of the passage in English of this interface. It come as a supplement to the topic created by Psykokwak where he explained how to install MyVera directly on the Vera. 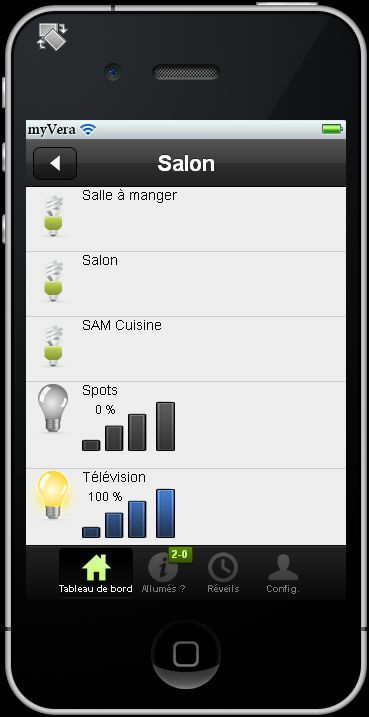 MyVera is an interface that allows you to control your home automation from your browser (chrome or safari only) or from a tablet or smartphone (ipad, iphone or android device). Psykokwak proposed a solution to put a server php directly on the Vera but you can use another solution (a NAS for exemple). The translation in English was realized by zolakk. By default, MyVera is in French. To translate MyVera into English you have to replace the file resources\locales\lang.json by lang_en.json. I've just installed MyVera on my apache2/php5 webserver and after giving write permissions to the protect/config directory it sprung to live. But I do not get any scrollbars using latest version Safari on OSX Mountain Lion, so I can not save any modules. Is there something I am missing? Looks absolutely fantastic, my compliments. Is there a way to go directly to the "Dashboard" tab when opening MyVera? And is there a way to hide the the tab to the left of the dashboard? Also, when I modify the text color or size of modules, this never has an effect. Even after saving and reloading the page. If you want go directly to the "Dashboard" (in Landscape and Portrait position), in the "General Config", put off the "Landscape View" and "Portrait View". You can't hide the tab's view. The color and size parameters are for views, not dashboard. In Retina mode, you have to write the size you want to see (50px by default for 100x100px images). In non retina, the size is the size of your icon's image (50x50px by default). Thanks sb_domo, that clarifies the situation! This is definitely an awesome tool to use on a tablet! 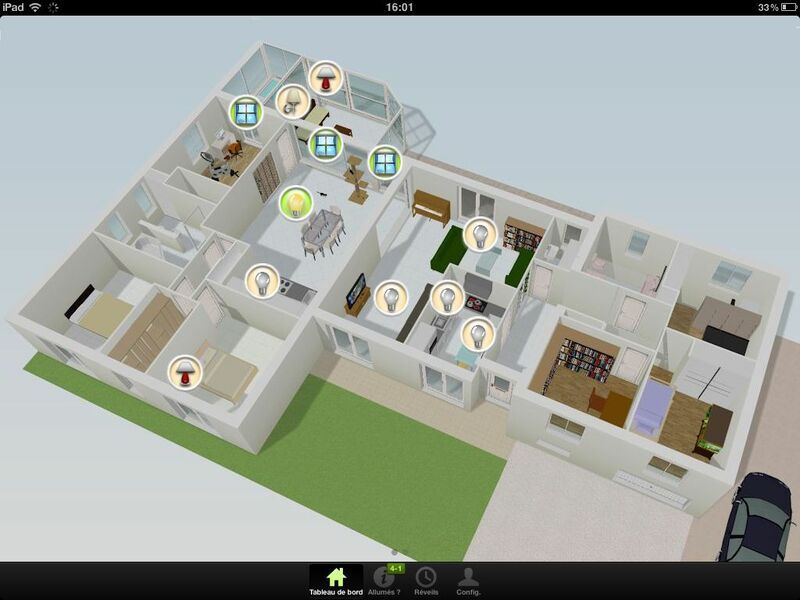 I used SweetHome 3D to design the layout of my house and it is all working well! I have a question about the HVAC though. It detects my thermostat as an HVAC unit which only displays a circle with a "?". If I change the category of the device to a "Smart Virtual Thermostat (Plugin)," I do get a prompt when I click on the icon in the layout of my house. The values show as Fahrenheit which is correct for my location but as soon as I click on the numerical temperature field, it goes immediately to 35 as the value which I assume is Celsius. Is there a way to use this as Fahrenheit? Initially, it reads the value correctly so it shows 73 degrees in the box but as soon as I click on it, the number changes to 35 as the max value.. This looks quite interesting and I have it installed. However, I don't have my VeraLite password protected, so what do I enter for username/password? Or is this to protect MyVera? Unfortunately Google Translate didn't really help with the Readme! I just typed in a "new" username and password and as long as my IP address field matched the Vera device on my network, it works! I'm not sure if the username and password field is there for the myvera application site or if it functions with a Vera device that has been configured to require a logon when using the internal network. In my environment, it doesn't appear to affect anything! I solved my own problem; php wasn't running on my server. I've fixed it and I'm good to go. I'm happy you think MyVera works well. I've installed MyVera on my WAMP-php server, the interface starts up, I enetered my login info, and it populated the rooms. Then I get an error-Error No response in sync. Try again?